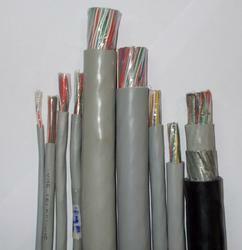 Manufacturer & Supplier of Telephone And Switch Board Cables. Everest® telephone and switch board cables are widely used today for communication in high rise buildings, offices, factories, hotels, hospitals, residential complexes, etc., has gained confidence, support and vast goodwill among users. Everest® telephone and switch board cables are made of high conductivity electrolytic grade annealed tinned solid copper conductor with nominal dia. of 0.5,0.6 & 0.7mm. The insulant is of hard grade PVC as per IS: 13176 (1991) type 2 and are properly colour coded. The insulated cores are twisted with a suitable lay to form a pair. The pairs are bunched together in a manner to minimise cross talk. These bunched pairs are then wrapped with polyester tape, further jacketed with grey colour fire retardant PVC along with nylon rip cord. EVEREST® telephone and switch board cables are manufactured as per ITD specification S/WS113 B, 113 C & 114 B and TEC specification No. GR/WIR-06/03(screened/unscreened) suitable for indoor telephone wiring, switch boards and intercoms. These wires are tested at 2000 volts. Looking for Telephone And Switch Board Cables ?